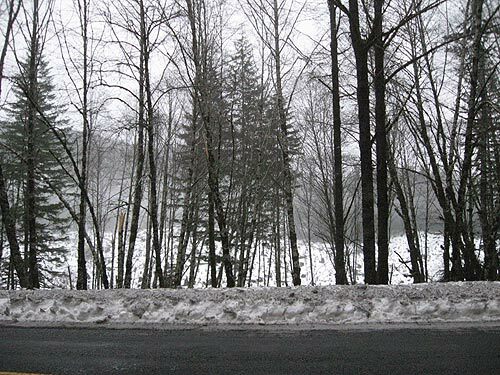 (Portland, Oregon) – The majority of Oregon is likely to get freezing temperatures and some amounts of snow throughout the week, although the dustings could be light or even non-existent. The National Weather Service (NWS) has issued several special weather statements regarding the I-5 corridor, Portland, coast range, the beaches and southern Oregon (picture above: snow on Highway 26 towards the coast). Predictions are for snow in Portland above 1,000 feet on Monday, but down to 500 feet on Tuesday and Wednesday. The big question that scientists have is if this weather system will still have enough moisture left in it by Wednesday and Thursday – so it’s still possible no snow will hit the area. However, freezing temperatures – with or without snow – are likely throughout the whole week around most of Oregon. Sinking snow levels will mean snowy conditions on mountain passes, and maybe some snow near the summit peaks in the coast range, perhaps lower. Tuesday night will see a low of around 33 degrees and freezing levels dropping to 500 feet in Portland. Snow showers are likely, according to the NWS. Wednesday will only get up to perhaps 35 degrees. Thursday, a high of a mere 32 degrees is expected. Eugene will be very similar, with snow showers likely on Wednesday, but little to no accumulation, even with temperatures dropping to 28 at night. Thursday will have a high around 38 and a low around 28, with more snow possible. Bend, of course, is a bit icier. The NWS is predicting a chance of rain and snow showers for Tuesday and a low around 24. Wednesday and Thursday, the high is expected at around 33 and a low of 22, with more snow possible. Medford – in southern Oregon - seems to have it a little warmer and similar to the predictions for Portland, with little to no accumulations happening through Wednesday. But much of southern Oregon, including the south coast, are in for at least a little snow. The Oregon coast is expected to get some snow as well, and this may spell trouble for the coast range. Snow levels are expected to get down to 400 feet on Wednesday and Thursday in the coast range, which will mean more icy or snowy roads far below the summits. Make sure you take those routes during the daytime, preferably late morning or in the afternoon.